Wendy's Delights: MoYou Nails Spectacular Giveaway - 10 PRIZES!!! 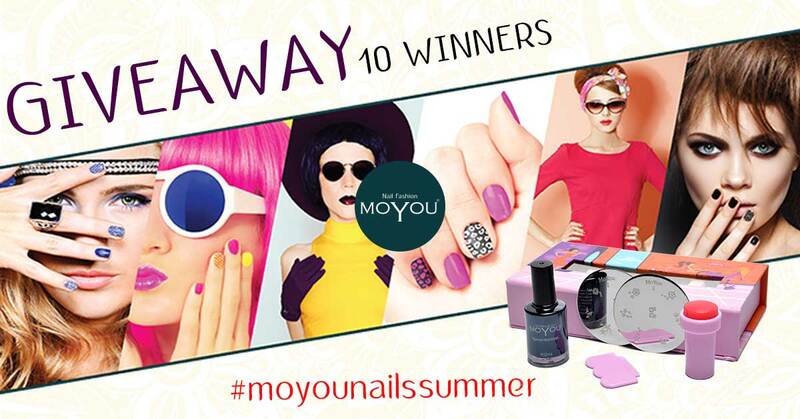 I'm delighted to share with you a fantastic Giveaway sponsored by MoYou Nails. MoYou Nails is London based and specialises in manufacturing nail fashion products. Among their products of nail art and design you can find fashionable nail polish colours and unique designed nail art sets, beginner’s nail stamping kits, stamping nail polishes and professional collections. The MoYou Nail Fashion Collection includes Salon Pro Collection, big boards and over 1500 individual designs, engraved to suit everyone’s style and to last a lifetime. I've been using MoYou Nails products for over 3 years and enjoy using their products and creating fabulous manis. Moyou Nail Fashion bring you the hottest trends, and creating the new must-have products and applications. MoYou is stunning, long-lasting nail fashion design and high quality decoration from a leading brand that won't let you - or your nails - down. Create super-artistic designs that your friends will love using their advanced nail kits and plates. From smashing summer holiday colours to cute classics and boho festival styles, you'll find inspiration and ideas to keep your fingertips looking fantastic for every occasion. Whether you love mattes or metallics, geometric patterns or vintage stamps, they've got you covered from workdays to weekends. Want to see demos and pick up hints and tips from the professionals? Make sure you're following their social media channels where you'll also be first to see great offers, discount codes and giveaways. Make your nails your canvas! Visit MoYou Nail Fashion today and start your own adventures in nail art. There will be 10 winners who will receive a MoYou Nails Kitty Set which includes a stamper, scraper, one polish & two plates of your choice. Whether you're a nail stampaholic or a beginner wanting to get into stamping, this is a fantastic set. The Giveaway is open to the UK only, due to our silly postal restrictions we cannot post nail polish outside of the UK. Please complete the Rafflecopter below, the more entries you complete the better chance you have of winning! Visit MoYou Nail Fashion today and start your own adventures in nail art. Make your nails your canvas!